Through-out the day today Social Media has been abuzz with one question – Is Self proclaimed hacker Ankit Fadia a brand ambassador for Digital India Mission. Earlier in the day official Govt had came out with clarification that, there was no such move to appoint brand ambassador for Digital India initiative. Here is a screenshot of the denial. However, the denial was later removed from the site and so were the tweets mentioning the same from PIB’s official Twitter account. The whole issue started when Ankit Fadia declared on his Facebook page that he was “Humbled and honored to be appointed as one of the Brand Ambassadors to Prime Minister Narendra Modi’s Digital India initiative.” Most of the online folks were quite surprised at this appointment and could not believe it. However, Government has now come out with another clarification and have stated that they have indeed appointed 4 Brand Ambassadors for Digital India mission to generate mass awareness of the program. Here is the the text of the release. Thereafter, no other person has been appointed as Brand Ambassador for Digital India. The services of these Brand Ambassadors will be used, as and when required for generating mass awareness for the programme. So, all the doubts and debate can now put to rest! 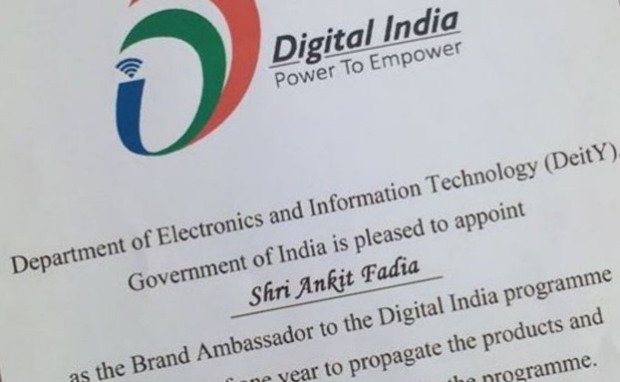 Mr. Ankit Fadia is indeed a Brand Ambassador for Digital India mission!